Holy cats, have I been busy! I don’t know why, but October is always an insanely busy month for me. I guess part of it is both our birthdays, and our anniversary, and Halloween, and I always end up travelling – sometimes multiple times – in October. I’ve also been working a lot lately. All that that is why I haven’t been posting much. We went to Charleston, SC a couple of weeks ago to visit Mark’s family. We left mid-week and right before we left, I did a quick sweep of the refrigerator for perishables and realized I hadn’t used the tofu I’d made that weekend, so I quickly threw it in a container and popped it in the freezer. I’m not a huge fan of frozen tofu; the texture doesn’t win me over as it does some, and it is so sponge-like it always seems to absorb so much salt it tastes too salty. Nonetheless I wasn’t about to waste homemade tofu, so in the freezer it went. I was looking for a way to use it and came across this post on the wonderful Just Bento. This idea is totally ripped off of Maki, but for my broth I just started pouring things into my Dutch oven, trying but not really to keep the sodium down. Whisk together the remaining ingredients except the cornstarch in a Dutch oven or wide saucepan then add the cutlets. Bring to a boil, reduce heat, and simmer gently for 20 minutes or longer. I think I left mine for 45 minutes or so. … and coat with cornstarch. Meanwhile you can thicken the (strained) leftover broth with some cornstarch (add the cornstarch to a small amount of cold water then whisk it in and heat until thickened) to make a gravy, though that’s optional. Look at these baby sweet potatoes I got. LOOK AT THEM! Wow – this was the best meal I’ve made using frozen tofu, and though I’d be hard pressed (haha, like my tofu) to call the broth low-sodium, it wasn’t too salty. The texture was good too: chewy, but not overly sponge-like. Very flavourful. I think I still prefer my tofu fresh but it’s great to know I can make something really good with it even if I end up having to freeze it. And actually, frozen homemade tofu is probably better than non-frozen store-bought tofu. Gomez, light of my life, fur of my clothes. My kitten, my cat. Go-mez-ian: the tip of your tail twitching to and fro across my toes. Go. Mez. Ian. He is Mez, plain Mez, in the morning, standing on my chest. He is Mezzie when he plays. He is Mezzaluna in the kitchen. 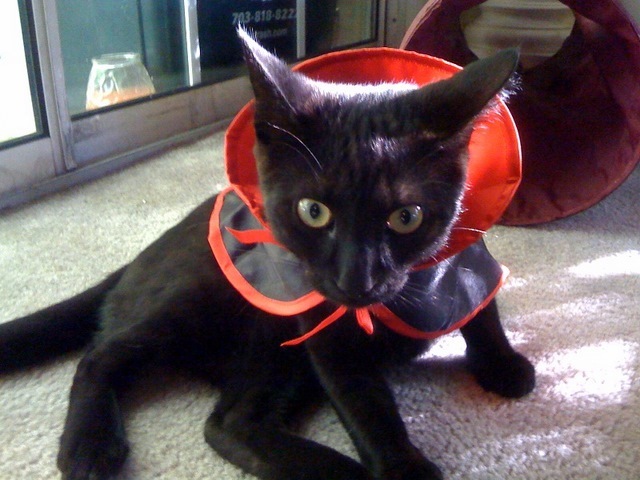 He is Gomez on the vet bills. But in my arms he is always Gomezian. 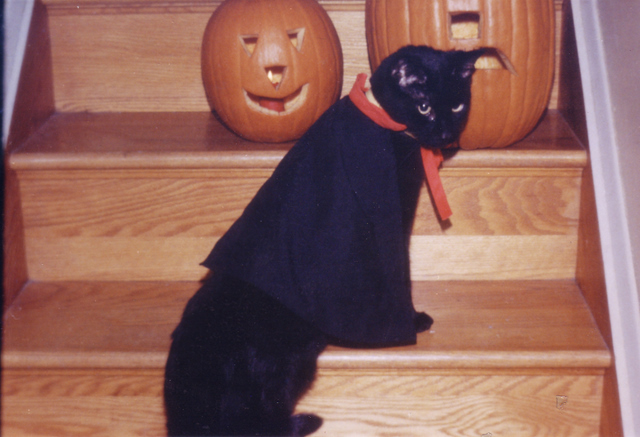 …and for Halloween he is Dracula! I was sad to hear that Benoit Mandelbrot passed away last Thursday. A few years ago I asked myself where my obsession with physics came from and although it took a lot of thinking to remember, I finally recalled a day I was visiting the beautiful main branch of the Enoch Pratt Free Library, looking through the science section for a book on fractals. I did in fact find a beautiful book on the Mandelbrot set, but on my journey to it I also came across a book on string theory, and I was hooked. That’s sort of a roundabout way of expressing my love of fractals, but my point is, like string theory, fractals – and specifically the Mandelbrot set – are one of those things that sort of define me because I love them so much. 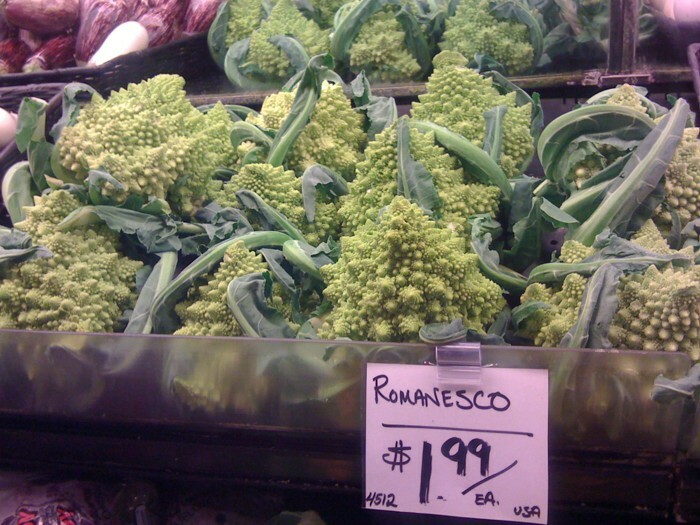 I was hoping to find romanesco – a fascinating fractal member of the cauliflower family – at the farmer’s market, as I did last year, all summer and autumn, to no avail. I’d given up, so it seemed like kismet when I found it at Wegmans tonight. I knew immediately I’d dedicate our meal tonight to Mandelbrot. I don’t really have a recipe for you – I just steamed the romanesco and whisked together a quick sauce – but I took some photos for your geeky pleasure. I guess it’s dorky, but to me this had a lot of symbolism: I find an intense beauty and peace in mathematics and science, and when you combine it with something as simple and nourishing as a vegetable, well, I’m just supremely happy. The sauce is just some soy sauce, tahini, Dragonfly’s Dry, Bulk Uncheese, water, and lemon juice, whisked and heated until a bit thickened. The kittens aren’t too sure how they feel about ole Nick (actually, having just read the wonderful Room, I don’t think I can refer to Nick in that manner, it being too close to “Old Nick”). They’re both pulling some weird “I’m an owl!” thing, and I don’t know WHAT Torticia’s doing in that top picture. It was not good. But once we got there, Charleston was warm, sunny, and full of delicious vegan pizza. And I got to see the following in a swamp! …which, yes, is their way of saying they love me. I’m not a big cheater. I’m one of the most honest people you’ll ever meet – I can not stand telling lies – and I really do believe that you only cheat yourself when you cheat others. And you know me: I make my own tofu, miso, pasta, pickles, bread…everything. Today, though, I was trying to figure out what to make with a fresh batch of homemade sauerkraut, and simultaneously wondering what to do with leftover mashed potatoes, when it all became so clear to me: pierogi. But then a minute later I thought, “ugh, I REALLY do NOT feel like rolling out pierogi dough”. But I still thought pierogi were a brilliant idea. So I cheated. I used gyoza wrappers. Sue me. But it was easy and, as far as pierogi go, fast. And still tasted great. So here you go: pierogi for people who cheat, or can’t be bothered with making pierogi dough. Unfortunately for people who require strict measurements in their recipes, I cheated that way too. I didn’t measure anything. I just smooshed everything together. I’ll try to estimate what I used, but this is really more an idea than a recipe. In a heavy (preferably cast iron) skillet, heat some oil, then add the diced onion and saute until beginning to brown. Remove from heat and cool at least slightly. Meanwhile, use kitchen shears to cut the sauerkraut into smaller pieces in a small bowl, then mix in the mashed potatoes and sauted onion. Next, assemble the pierogi. I found it easiest to use my fingers to place about a teaspoon of the potato/sauerkraut mixture into the middle of each gyoza wrapper, and since that made for messy fingers, I set several pierogi up at a time before closing and sealing them. Keep the remaining gyoza wrappers covered with a damp towel while working in batches. … then squeezed shut to seal. If they aren’t sealing well, dab some water on the edges first. Alternatively, close and seal with your fingers. Continue until all the filling is used up. I made about 32 pierogi. Bring a large pot of water to a boil and drop about 8 pierogi in at a time – you don’t want to crowd them. Boil until the pierogi float, then remove with a slotted spoon. Continue boiling the rest of the pierogi this way, or you can freeze half of them, which is what I did. You can eat the pierogi boiled, with (vegan) sour cream if you like, or you can take the extra step of pan frying them. If you pan fry them, you can first brown a diced onion in some oil in your heavy skillet, then add the pierogi and brown on each side. Pierogi are really, really, really, really good. I served them with additional sauerkraut and some leftover cucumber salad. In other news, I know I keep talking about how huge Gomez is, but this weekend I noticed Torticia is getting bigger too. I think she’s going through a growth spurt because she is eating a ton of food and she looks noticeably larger to me. (She is also currently sitting on my lap “helping” me type because she’s the sweetest cat on the entire planet.) She’s still much smaller than Gomez, though she’s also still the dominant one. Gomez would hardly ever get into trouble if his sister didn’t lead him there, but she does, and she does it often. You can see “trouble” written all over her, can’t you? That’s Torticia with a capital “trouble”.